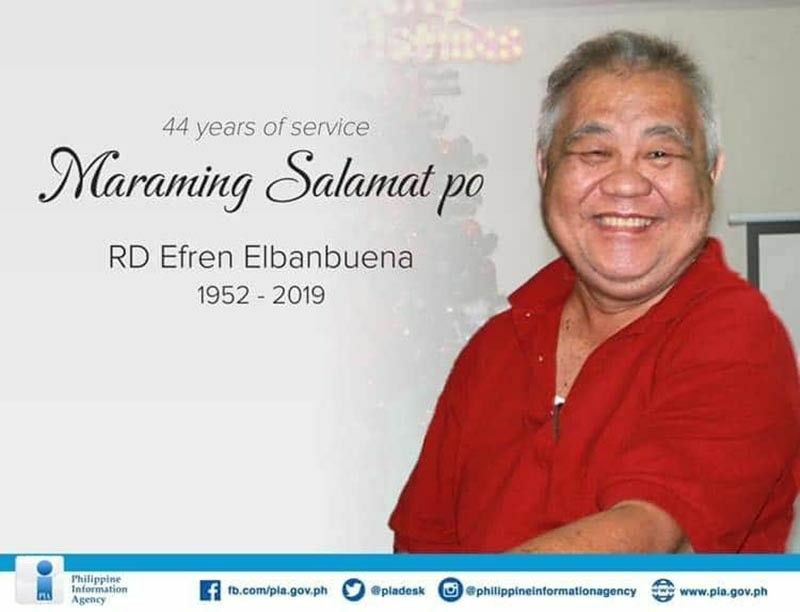 ONE of the well-respected media personalities in Davao Region Efren F. Elbanbuena, former regional director of the Philippine Information Agency (PIA) 11, passed away around 6 a.m. Tuesday, April 2. He was 66. Elbanbuena’s niece, Grace Gecosala Santos, confirmed his death in a social media post. He passed away at San Pedro Hospital in Davao City after he experienced breathing difficulty and suffered from a complication due to diabetes. He had been confined at the hospital since March 23, 2019. Family, friends, and media colleagues remember the former official who led PIA-11 since 1992 until his retirement in February 2018. He entered government service as staff assistant at the now-defunct Department of Public Information in 1973. One of his long-time colleagues, Edith Isidro, media relations officer of PIA 11, shared how Elbanbuena inspired her life as a government communicator. “It saddens me and us to learn of the untimely departure of a dear boss, friend, and father. Since I joined PIA, he really stood as a kind mentor who molded me to become a strong woman and contented in life. I pray for the peaceful repose of his soul. We really miss Boss Efren,” she said. Former deputy director general Leo Omoso also offered condolences to the bereaved family. “My condolences to the surviving spouse and children of our dear Efren Elbanbuena. Efren, indeed, had contributed great ideas in the government efforts of attaining lasting peace in Mindanao. I join the whole family of our dear friend in their hour of bereavement. As I pray for the eternal light shines on him for the eternal rest of his soul my heartfelt condolence,” he said. Mafek Negrido-Gamale of Technical Education and Skills Development Authority Region (Tesda) 11 described him as a man of commitment and dedication. “To the man who has touched so many lives, to the one person who was always generous in sharing his knowledge and limitless ideas with everyone, I will forever be grateful to have been able to rub elbows with you, to have learned so much from you. I will surely miss you Sir Efren!” Gamale said. Another friend, Marlon Peter Dedumo, who works for a non-government organization, said he will always remember him as one of his best friends and a fatherly mentor. “You have taught me a lot more than anyone else in our field of work, helped me without hesitation every time I need assistance and most of all how to build relations not just contacts. I will miss the hours we spend talking and planning in your office every time I visited you. Rest in peace now and may your legacy live on,” Dedumo shared. Peng Aliño, acting station manager of PCCO-PBS-BBS-Radyo ng Bayan, also remembered Elbanbuena as accommodating, friendly, and a leader with a good heart. PIA 11 also issued a statement Tuesday, underscoring Elbanbuena’s dedication to work and heart for people. “His exemplary dedication to public service in his forty-four years in the government has been marked by determination, selflessness and patriotism. Outside the service, he was known to be a dependable, passionate and strong-willed, truly, traits of a great man,” PIA said in a statement. His remains are at Sta. Theresa Funeral in Panabo City (along the national highway, before SeaOil Gasoline Station).